In the 12 new technologies where the Group has filed for 106 patent applications since 2007, the Company has started fast reaping the benefits. It very recently got 2 more patent grants for its BRYSCANTM technology – patent filed with regard to moisture analyzer; 4 more patents granted/ allowed for DryPurge® – method and system for improving the performance of desiccant dehumidification equipment and in 1 patent granted for Moisture Stat – device and method for moisture control (total – 31 patents granted/ allowed already across the 12 technologies). Bry-Air Prokon’s patented BRYSCANTM inline sensor technology measures moisture down to 5 ppm. Swiss made reliable and robust inline moisture analyzer – Moisture MinderTM has over 150+ satisfied customers globally and over 200+ plastic resin product database. Bry-Air’s patented DryPurge® (DP) technology is the most efficient and economical solution to provide dry air required for lithium battery manufacturing and special grade coloured nylon blended PET bottles.. The desiccant dehumidifiers incorporating DP technology ensures optimum performance of dehumidifiers, even at ultra low dew point, upto (-) 90℃. 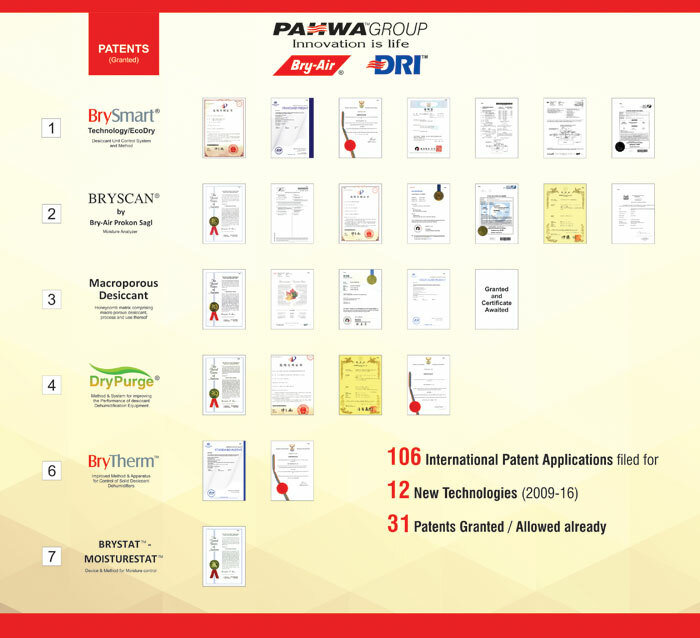 “Customer First” in all it does, is what lead Pahwa Group to continuously innovate, research and file patents to safeguard its customers and the company’s interest. Pahwa Group ensures its customers get the exclusive best in adsorption technology. The products from Bry-Air, integrate Industry 4.0. tomorrow based concepts and technologies.